This revolutionary rollator offers many unique features, it weighs only 10 lbs. vs. 16 lbs. 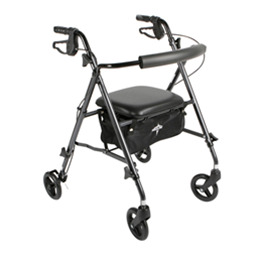 for traditional rollators, it has a seat height adjustable to accommodate people 4'10" to 6'2", and it serves as a standard and a junior rollator. The rollator has a high end bag under the seat with water resistant pouch and shoulder strap.